The entries on here always run at least several days behind when I actually make things. If I’m good, it’s only the night before. Other times, it may be weeks. I don’t think I’ve made it to a month before. But this time, I have an excuse! We were on vacation last week (in France and Germany). And I’d post pictures now but they’re still sitting on my camera. And there are lots of them to go through. The vacation was fun but has very little do with Risi e Bisi. 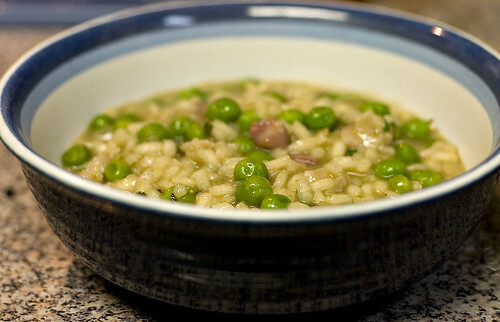 Risi e Bisi is apparently a signature dish of Venice. While I’ve been in Venice, I didn’t try this there. It was the wrong time of the year (I was there in June which is not really pea season). So I have no idea how authentic this version is (outside of the claim from the title of the cookbook). I thought it was good but the real news is that Angela liked it. This is surprising because she a) doesn’t usually like risotto and b) doesn’t usually like green vegetables. So, apparently, I must really have a winner here. It’s typical of much Italian cooking in that it is rather understated. None of the flavors are particularly strong or overpowering. However, they end up well balanced without being bland. What really drew me to this recipe (outside of the fact that I’ve liked other cookbooks in the series), was the fact that it used the pea pods to make a stock. This actually ended up delaying me by a day for when I could make the risotto (I ended up making the pea pod stock a day in advance) but my experience is that anything that has a stock specifically made for it is better. 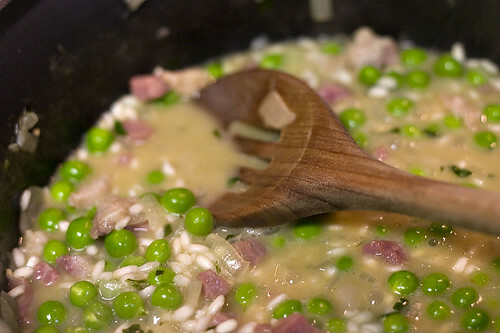 It really helped for the flavor of the peas to permeate the entire risotto. You could, however, just replace the pea pod stock with 2 cups of meat broth. And, speaking of meat broth, I’ve found that at least for risotto, using a combination of chicken and beef stock produces a better flavor than either of them alone. This also applies to rice pilaf. And if you happen to have duck stuck lying around, try it in a simple risotto. Rinse the pea pods in running water. Place the pods in a pot and cover with cold water by 3 inches. Bring the pot to a boil over high heat, then reduce heat to a simmer, and simmer for four hours. Then run the liquid and the pods through a food mill fitted with the fine disk. Combine with the meat stock and place over low heat to keep warm. Season with salt if needed. 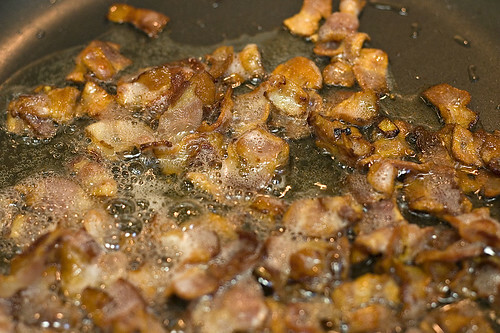 In a large skillet, melt 3 tbsp of the butter with the olive oil over medium heat. 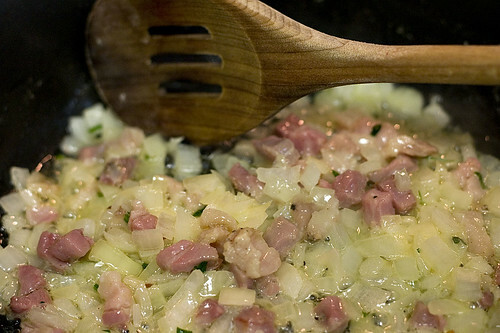 Add the onion and pancetta and sauté until the pancetta is browned and the onions are soft, about 4 minutes. Stir 1 tbsp parsley and the rice into the skillet. 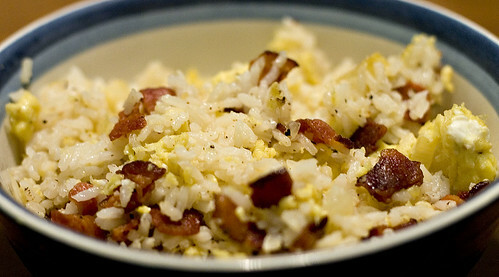 Cook the rice for about 4 minutes, stirring occasionally. Add the vermouth and simmer until the alcohol has evaporated, about 3 minutes. Add a ladleful of the broth and the peas and stir regularly until most of the broth has been absorbed. Add more broth and continuing stirring until all of the broth is absorbed and the rice is cooked through, about 25 minutes. Remove the risotto from the heat. Season to taste with salt. Stir in the remaining butter and parsley.